Corn is one of many ancient grains. It is believed that corn was first grown on the Mexican plateau or the highlands of Guatemala. Early corn was believed to be similar to oats and barley with each individual kernel covered in a husk. Did you know that corn is the only plant which cannot reproduce itself without the help of man who must plant the kernel. Nutritionally, corn (cooked or raw) is low in fat and calories and provides almost three grams of dietary fiber as well as protein per ear. Yellow corn is plentiful in vitamin A which improves our vision and prevents night blindness, promotes the formation of strong bones and it helps to improve skin conditions like acne or psoriasis. Corn also supplies the body with magnesium which acts as a natural tranquilizer. Called the “anti-stress mineral,” magnesium aids in relaxing nerves, relieving tension and assists with our digestion. Since heat rapidly converts the sugar in corn to starch, it is very important to choose corn that is displayed in a cool place. Look for corn whose husks are fresh and green and not dried out. They should envelope the ear and not fit too loosely around it. To examine the kernels, pull back part of the husk. The kernels should be plump and tightly arranged in rows. You can test for the juiciness of the corn by taking your fingernail and pressing on a kernel. Corn that is fresh will exude a white milky substance. 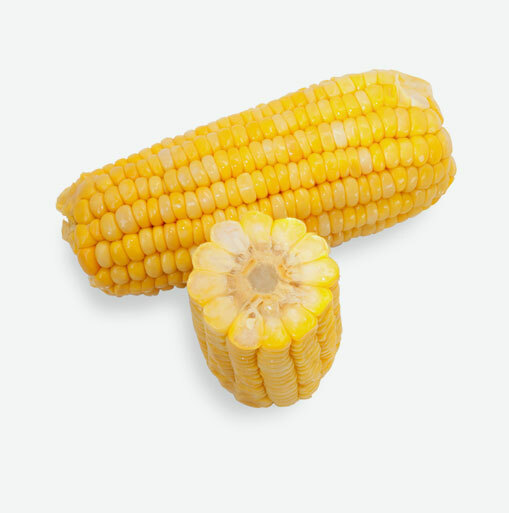 Purchase corn on the day you are going to cook it since corn has a tendency to lose its flavour rapidly. Store corn in a plastic bag in the refrigerator. Do not remove its husk because this protects its flavour. Grilling Corn: The special benefit of cooking corn on the grill in the husk is that none of the flavour or nutrients are lost in the water as with the boiling method. Start by soaking whole ears of corn in their husks in a large bowl of water for 15 minutes to 1 hour. Soaking makes the ears easier to shuck and helps to retain the moisture in the kernels. Prepare the barbecue for grilling. When coals or grill is hot, place whole, unshucked corn directly on the grill. Cover grill, and cook 5 minutes. Lift cover and using tongs, turn corn about a 1/4 turn. Cover and cook another 5 minutes. Turn corn again about a 1/4 turn, and cook 5 minutes longer. The husks should be quite blackened. If the corn is young to medium, 15 minutes is just about right. For medium to large kernel corn, 20 minutes is perfect. Allow 5 minutes for corn to cool. Shuck and enjoy the juiciest corn you’ve ever had.